Emmitsburg, MD — George Navarini, Spaatz #407, recently graduated from FEMA’s National Emergency Management Academy at the Emergency Management Institute in Emmitsburg, Maryland, after he completed the full curriculum that provides the basic knowledge and skills to help him meet the unpredictable challenges in the field of emergency management. Navarini, a graduate student at American Military University from Pembroke Pines (Miami), Fla, completed the five courses in this Academy that includes Foundations of Emergency Management; Science of Disaster; Planning: Emergency Operations; Exercise Design; and Public Information and Warning. To graduate, he fulfilled a total of 167 hours of training. Emmitsburg, MD March 20, 2014–FEMA’s Emergency Management Institute (EMI) George O. Navarini (right) completed all requirements of the National Emergency Management Academy. Edward Smith, Acting Deputy Superintendent, EMI, is shown congratulating Mr. Navarini as he graduates. The National Emergency Management Academy offers the tools to develop comprehensive foundational skills needed in emergency management. For those who are new to emergency management or for those who are transferring from another profession, this Academy also provides a unique opportunity to build camaraderie and establish professional contacts. Students also learned to understand the roles, responsibilities and legal boundaries associated with emergency management. FEMA’s National Emergency Management Academy is the entry-point for individuals pursuing a career in emergency management. It’s the first phase of FEMA’s new Emergency Management Professional Program (EMPP). The EMPP curriculum is designed to provide lifetime learning for emergency managers and includes four separate, but closely related training programs including the National Emergency Management Academy; a Specialized and Technical Training program to develop specific skill sets; the National Emergency Management Leaders Academy to develop the next generation of emergency management leaders; and the National Emergency Management Executive Academy for Federal, state, tribal and local agency executives at a senior policy and strategy level. Navarini is a former Director of The Spaatz Association, and a 1979 Falcon Award recipient. He completed his training on March 20, 2014. 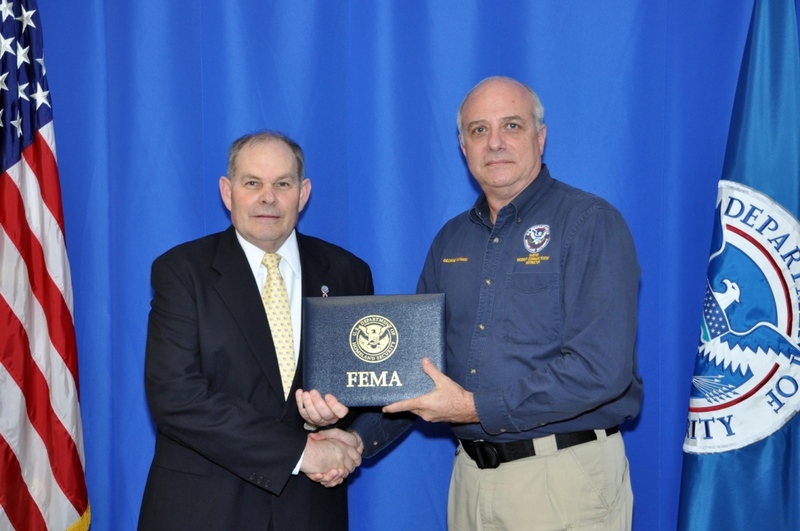 For more information on FEMA’s training to include: the National Emergency Management Academy, the National Emergency Management Leaders Academy, and the National Emergency Management Executive Academy, or other courses, go to http://training.fema.gov/empp/.